Upon agreement, Premier of the State Council Li Keqiang will hold the second roundtable with World Bank Group President Jim Yong Kim, IMF Managing Director Christine Lagarde, WTO Director-General Roberto Azevêdo, ILO Director-General Guy Ryder, OECD Secretary-General Angel Gurria and FSB Chairman Mark Carney in Beijing on September 12. They will have in-depth discussions on economic growth, structural reform, sustainable development, trade and investment, financial stability, innovation and entrepreneurship, employment and other issues. At the invitation of Foreign Minister Wang Yi, Khawaja Muhammad Asif, Foreign Minister of the Islamic Republic of Pakistan,will pay an official visit to China on September 8. China and Pakistan are all-weather strategic partners. The two countries have maintained sound development momentum in bilateral relations with frequent high-level exchanges and productive cooperation outcomes. Foreign Minister Khawaja Muhammad Asif's visit is another important interaction between China and Pakistan, which we believe will further advance the implementation of the cooperationconsensus reached between the leaders of the two countries, deepen across-the-board practical cooperation centered on the China-Pakistan Economic Corridor, and promote communication and coordination on international and regional affairsbetween the two countries. During Foreign Minister Khawaja Muhammad Asif's visit, Chinese leaders will meet with him and Foreign Minister Wang Yi will hold talks with him. The two sides will exchange views on China-Pakistan relations and international and regional issues of mutualinterest. Q: The Dialogue of Emerging Market and Developing Countries has drawn great attention. Some say that the exploration into and implementation of the "BRICS Plus"cooperation approachis a highlight of the BRICS Summit in Xiamen and a major innovation on the Chinese side. Do you agree with that? A: Yesterday, the Dialogue of Emerging Market and Developing countries was held on the sidelines of the BRICS Summit in Xiamen, which marks the first such dialogue held between BRICS countries and the emerging market and developing countries worldwide. Leaders of BRICS countries have discussed and planned international development and cooperation with their counterparts from Egypt,Mexico,Tajikistan, Guineaand Thailand, and they have unanimously agreed to speed up the implementation of 2030 Sustainable Development Agenda and establish broad development partnerships, sending out a strong message of deepening South-South Cooperation and global development and cooperation. Leaders of various countries have all agreed that they need to forge a "BRICS Plus"cooperation approach, jointly find a path of innovative, coordinated, green, open and shared sustainable development, and inject more positive energy into world economic growth and common development of countries. The success of this Dialogue proves that the "BRICS Plus" cooperation approach advocated by China has been widely applauded and supported by the extensive emerging market and developing countries. The "BRICS Plus"cooperation approach will not only be conducive to strengthening the solidarity and cooperation between BRICS countries and the emerging market and developing countriesand building broader partnerships, but also help the emerging market and developing countriesto make greater contributions to promoting world economic growth and improving global governance. We are convinced that with the help of the "BRICS Plus" cooperation approach, the circle of friend of BRICS countries will surely grow larger and larger and the path of BRICS will become wider and wider. Q: China's military practiced shooting down an incoming missile as part of an exercise yesterday morning in the Yellow Sea. What is the aim and message of doing so? A: I have not heard about this news and got no information at hand. You may refer to the Chinese military if you're interested. Q: Has the "BRICS Plus"cooperation approach been endorsed by the rest of the BRICS countries? A: The concept of "BRICS Plus" is the consensus among BRICS countries, and it is also reflected and embodied in the relevant outcome documents adopted at the Xiamen Summit. Q: Vietnam has protested against live-fire drill by the Chinese military in the Xisha Islands. What is your response? A: The Xisha Islands are an indisputable part of China's inherent territory. 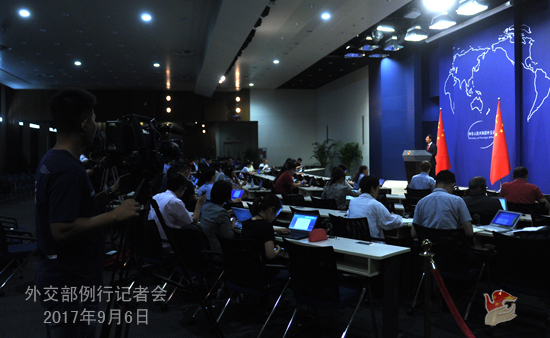 The relevant military exercise by the Chinese armed forces near the Xisha Islands falls within China's sovereignty, and we hope various parties can regard it in a calm and rational way. Q: There are reports that Russian President Vladimir Putin said that under no circumstances will Russia accept a nuclear-armed DPRK. Does China have any response to that? A: The commitment to denuclearization of the Korean Peninsula and opposition to the DPRK's nuclear and missile development is China's consistent position,and such position remains firm. Q: There are reports that some ports at the border between China and the DPRK have been closed in recent days. Can you confirm that and give us more details? A: I am not aware of this information. Q: There are reports that the remaining four THAAD launchers may be deployed in the ROK in the small hours tomorrow. What is your response? A: The Chinese side expresses serious concern over the relevant move. I would like to reiterate that China's firm opposition to the THAAD deployment in the ROK by the US is clear-cut, consistent and firm. The THAAD deployment in the ROK will in no way address the security concerns of the relevant countries and only severely undermine regional strategic balance and jeopardize the strategic security interests of China and other regional countries. Moreover, it will exacerbate the tensions and confrontation on the Korean Peninsula and complicate the Korean Peninsula issue. 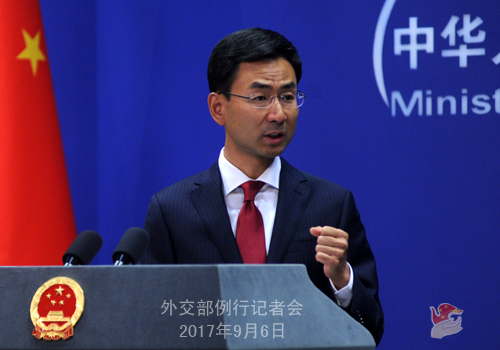 The Chinese side strongly urges the US and the ROK to value the security interests and concerns of China and other regional countries and immediately stop the relevant deployment and remove the relevant equipment. 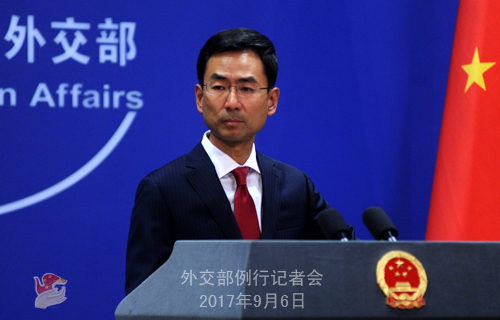 Q: Does China believe India, Pakistan and the DPRK, which has conducted 6 nuclear tests, are nuclear-weapon states? A: The international law has clear stipulation on which countries are nuclear-weapon states.